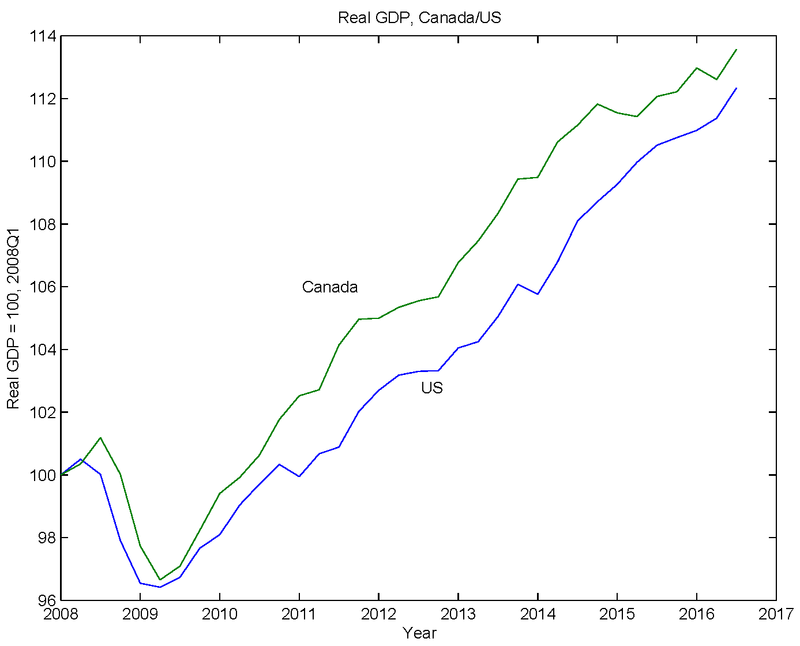 "But, I think it's hard to look at the Canadian experience and think that it takes as much as $1 trillion in interest bearing Fed liabilities to make a floor system work in the US, as Bernanke is suggesting. I would be surprised if we needed as much as $100 billion." Totally agree. 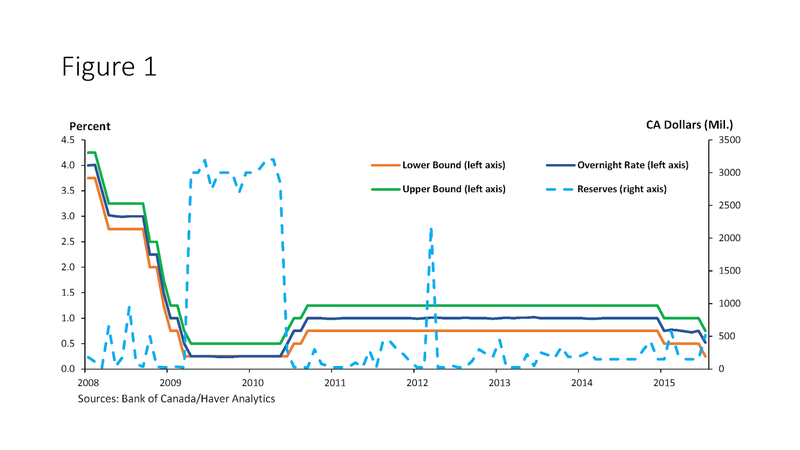 Not sure how Bernanke derives his figure. 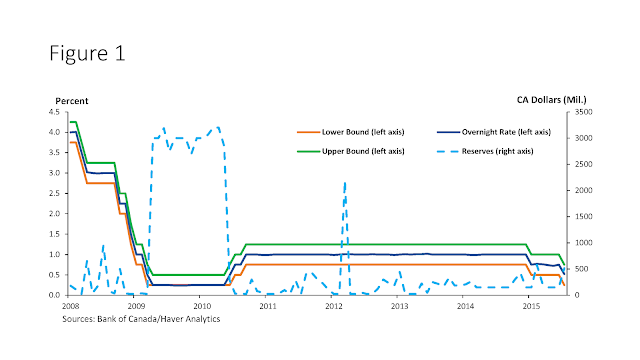 "One approach to uncovering the effects of QE is to look for natural experiments. " 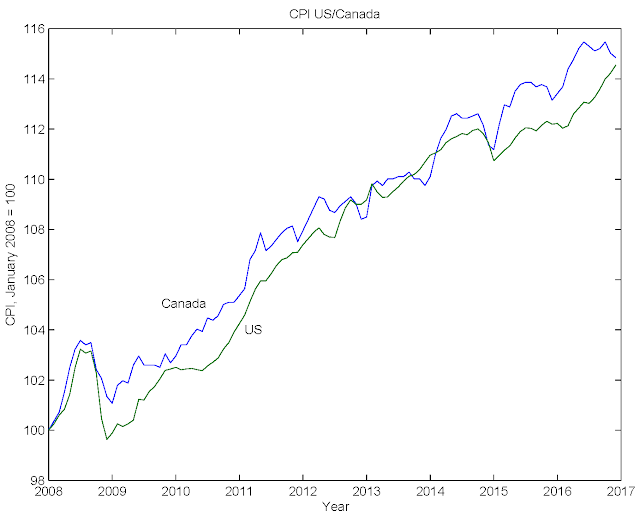 Your CPI chart tells one story, NGDP tells another. 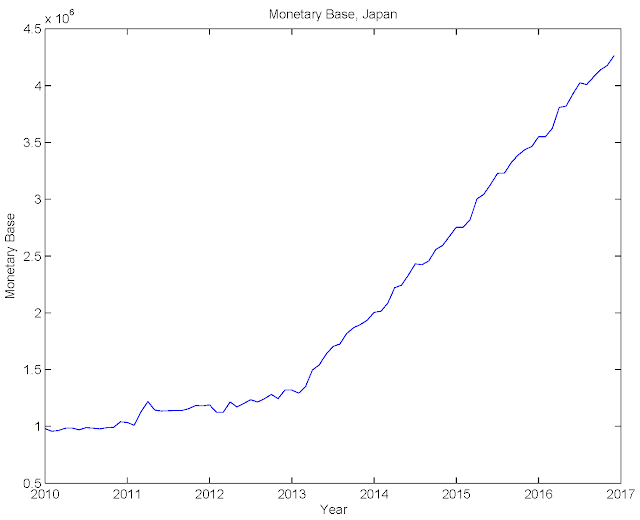 The Bank of Japan stated explicitly that it wanted to increase inflation to a sustained 2%, and they were going to do it with QQE. The CPI chart shows it didn't work. 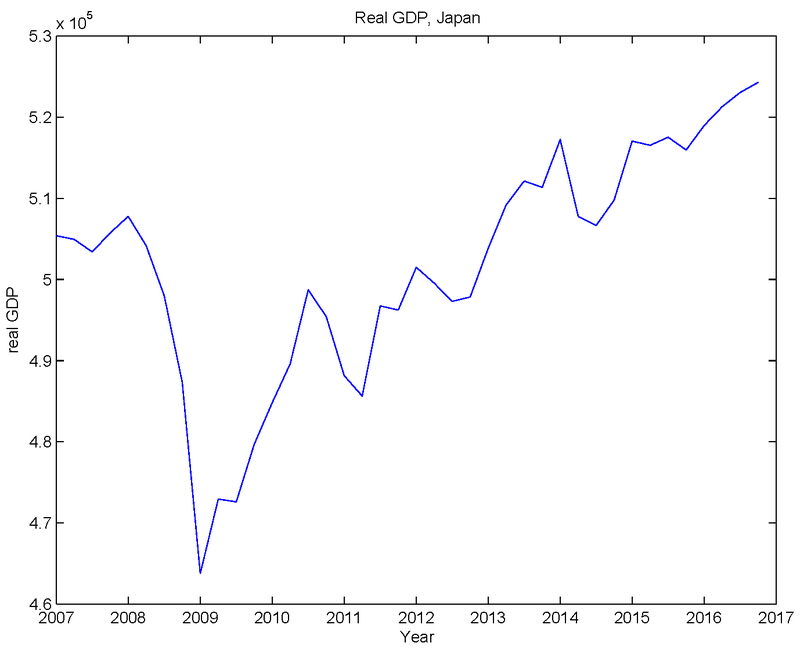 But maybe I could look for real effects of QE, in which case I don't think I should be interested in nominal GDP, but in real GDP. I got frustrated trying to find the time series, but please let me know if you can. Thanks. I didn't scroll down far enough. See the chart above. I don't see anything going on there. 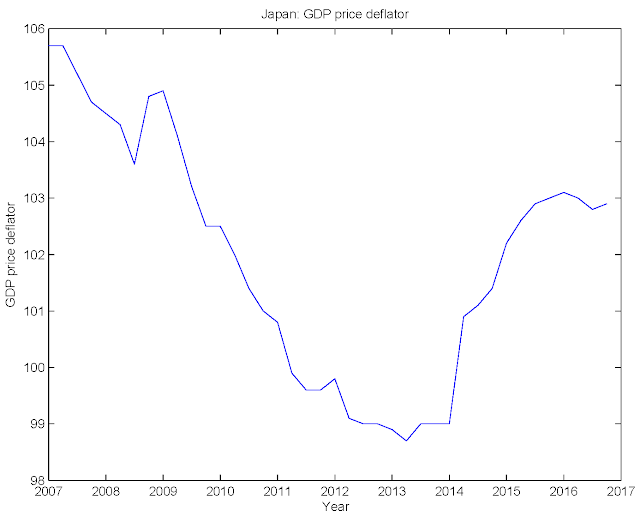 See also the chart for the GDP price deflator above. Certainly, the BoJ has failed to hit its inflation target. But I think JP's point is a little different. He's trying to argue the deeper question of whether QE policy can be used to move spending in the economy, AD. 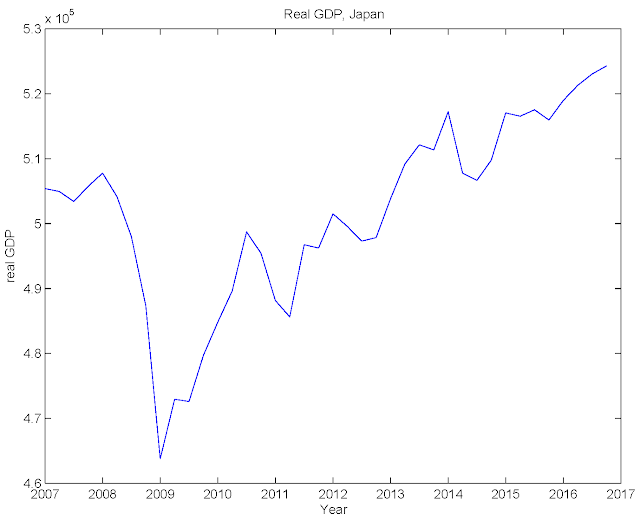 He's saying that the GDP graph shows that, nonetheless, the BoJ's QE policy has had a tremendous effect on AD, which he treats identical to Nominal GDP. If QE policy can be used to move AD as Bernanke claims then this should be reflected in changes in NGDP. The BoJ cannot have any control over how changes in AD are split between inflation or real GDP. So, the test if whether QE has this claimed power to influence spending must be over whether it affects GDP. Whether inflation or real GDP change in response is a different and less important question. In sum, I think you and he are making different points, both right. He used employment instead of real GDP. 1. If one makes vague claims about how a policy works, and what its effects are, that makes it easy to claim success. 2. In particular, making claims in terms of effects on "aggregate demand" is a well-worn vagueness technique. "Aggregate demand" is only a thing in a particular undergraduate macro model - it's not observable. 3. But, if you're claiming that the proof of success of QE is an effect on nominal GDP, then surely I'm free to decompose the effect into the effect on real GDP, and the effect on the GDP deflator. 4. Your claim is that the effect on nominal GDP is "tremendous." The policy is implemented in April 2013, so we should look for the effect after that date. What do I see in the last two charts? 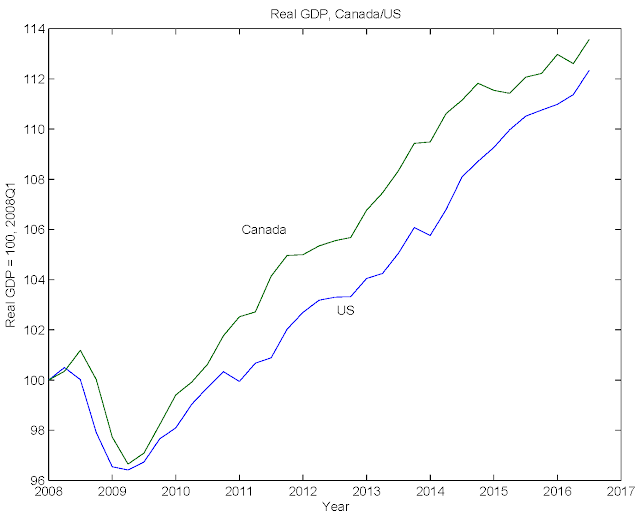 Real GDP is choppy, but I don't discern any change in trend growth resulting from the policy. What about the GDP price deflator? 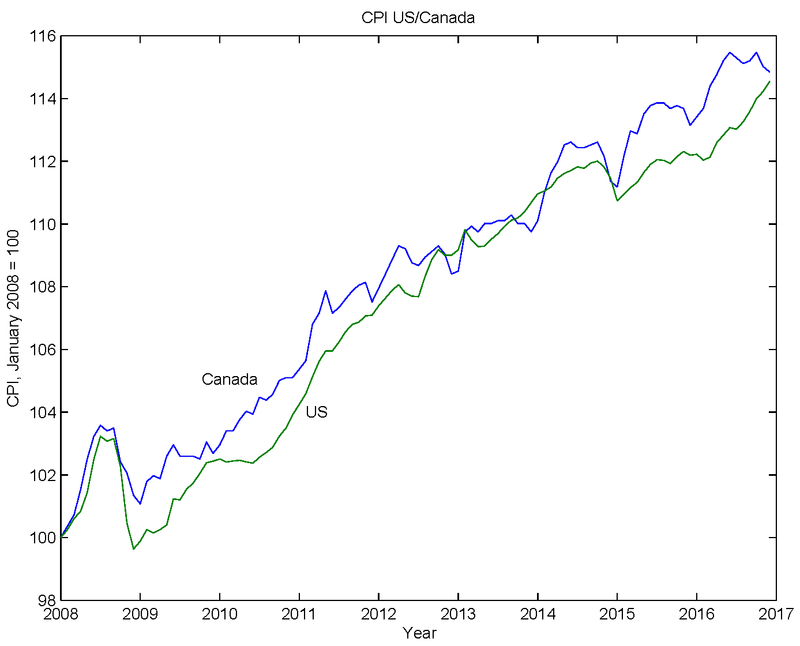 Post-2013, it's roughly the same story as for the previous CPI chart. There's an increase in the price level, mainly during 2014, with average zero inflation for the last two years. 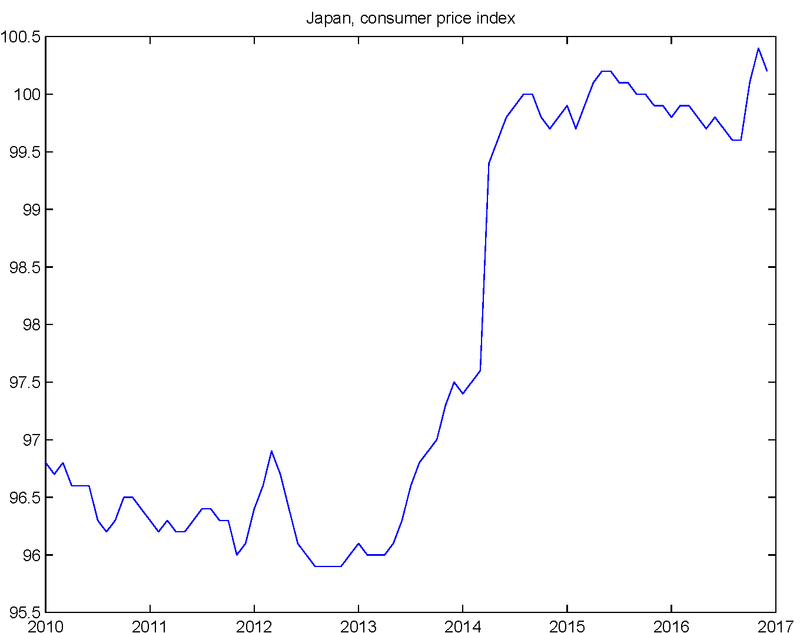 And we know that part of the price increase comes from the direct effect of the consumption tax - not QE. 4. 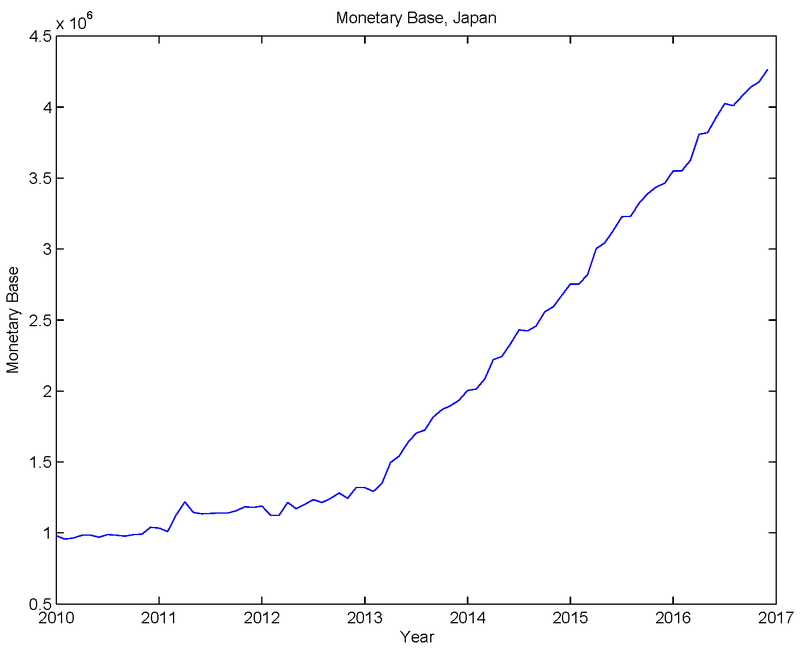 So, the goal of the Bank of Japan was to use QE to produce a sustained inflation rate 2%. Didn't happen. Failure. And it doesn't appear to have had any effect on the real economy either. Great post! I am looking forward to the end of the reinvestment policy that should have started in mid-2009 when the recession ended.